Dallandra used Plastimake to create this awesome pair of armoured gloves. In case you missed it, be sure to check out Dallandra's costume pistol that we posted a few weeks ago. 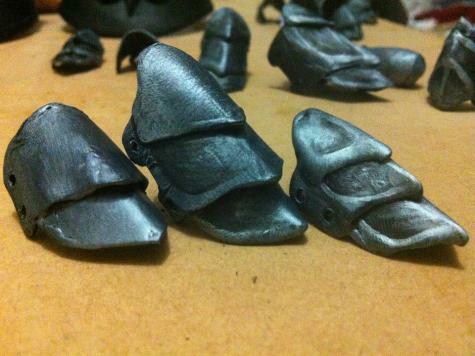 You can follow more of Dallandra's impressive costume projects over at the Cos Plus Play Facebook page. Create a pattern out of paper or cardboard by tracing around your fingers. Outline the section where the finger joints are. Add 0.5-1cm seam allowance so that the sides of your fingers will be covered too. Cut paper sections out. Trace your pattern onto a flat sheet of Plastimake and cut out each piece. Label the sections as you go, eg: LTP -Left tip pinky, RMI -Right middle Index. 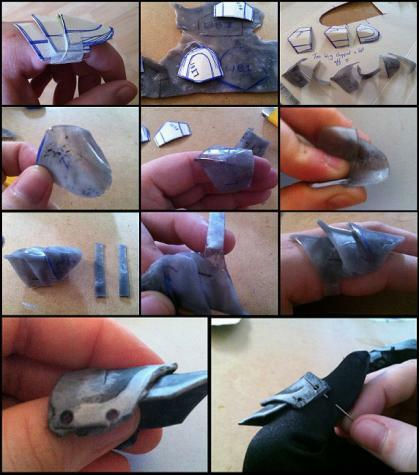 Gently bend the Plastimake pieces to match the curves of your fingers. If you want a 'spine' detail like these gloves, fold down the centre, then with a cigarette lighter heat the spine area only. With wet fingertips, mould the point and the centre ridge. Heat Plastimake at a distance of 2-3 cm, not directly in the flame. 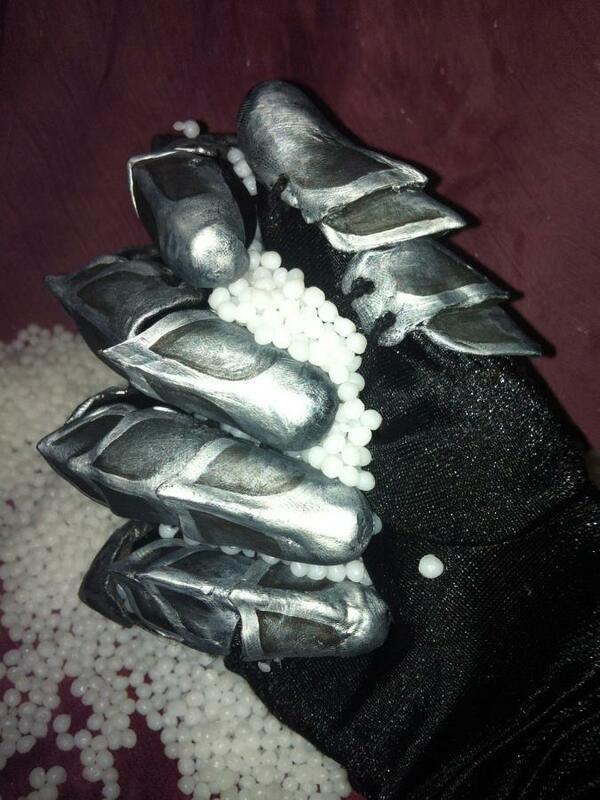 Dallandra experimented with two different methods for fastening the Plastimake plates to her hands. 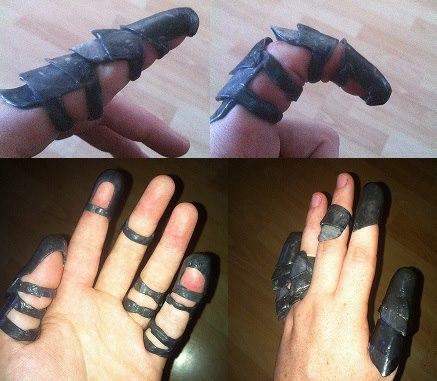 Her first attempt involved making a small Plastimake ring attachment for each piece. 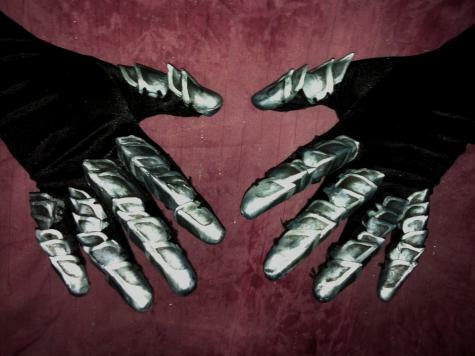 The second, more conformable method involved sewing the pieces to a fabric glove. 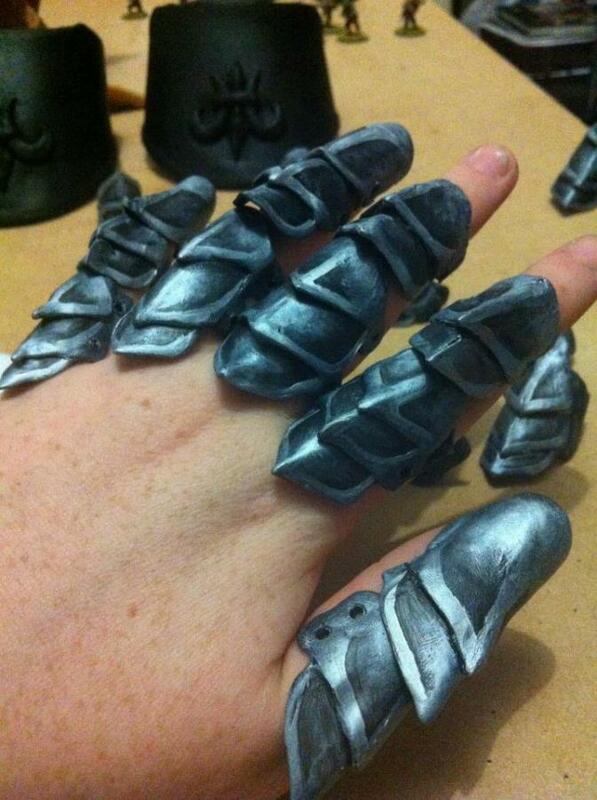 Rings: Heat the sides of the plates gently and mould the plates to your fingers more firmly. Dip in cold water while held in the desired shape, or hold until set. 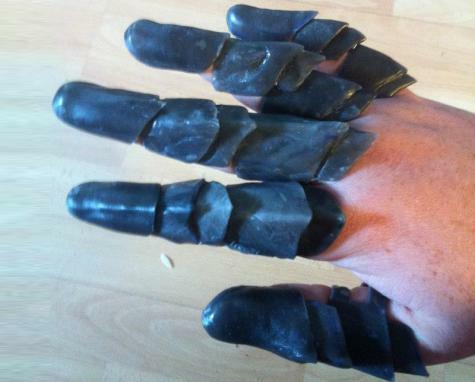 Form thin strips of Plastimake, heat the end of a strip and part of the finger plate, then stick them together. Heating both areas of the join will form a strong bond. Repeat the process with the other end of the band. They are ready for painting and wear! Sew on to a glove: Using a dremel tool, drill holes into the sides of the plates where the ring bands would go. Paint if desired and hand sew directly onto a leather or cloth gloves.